I have successfully connected my desktop(windows 10) to my Macbook pro(os siera) however, everytime the mouse leave my pc and in to my mac, the connection seems to disconnect. Hi @benjamin180692. Please provide more details about your machines (OS, 32/64 bit, Synergy version installed, connected to the network via Ethernet or Wi-Fi, specify which one is the server). Also, post a screenshot of both machine's Synergy interface and the Server Configuration interface on your server machine. These are the possible cause of your connectivity issue. Your Mac machine is on 172. 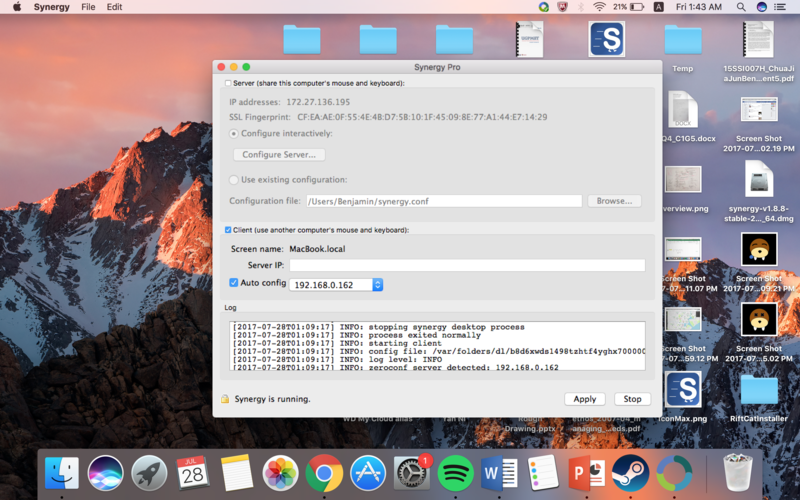 27.x.x network while your server is on three different networks and those networks is not inline with that from your Mac. Your Windows machine doesn't show an SSL fingerprint. Let me know if there's any progress on this after fixing those possible causes. I was able to connect them on the same network. however, when moving my mouse from pc to mac, the mouse freezes after approx 2-3 secs upon entering my macbook. I tried using my macbook as the server and my pc as the client. I t was able to work seamlessly. Anyway to use pc as the server without the mouse freezing? Hi @benjamin180692. Are you using Synergy v1.8.8 on both machines? If so, have you tried using v2 Beta Early Access? You can download it from the tagged forums thread below. Tried what you recommended and still not working. The log from my pc.